Marketing Board). 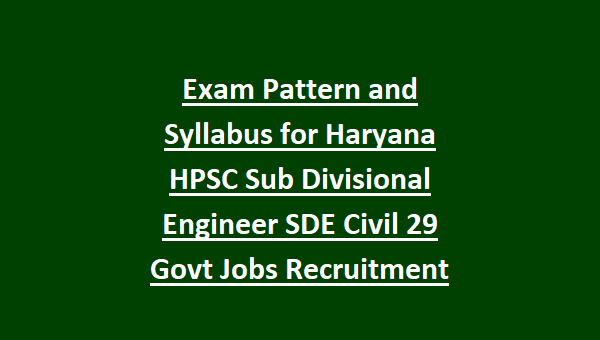 There are total 29 SDE Posts in this Haryana HPSC recruitment 2018. 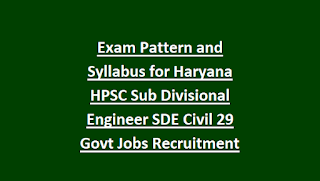 HPSC has also released exam syllabus and pattern for this Sub Divisional Engineer Civil Posts. Last date to apply online is 22-05-2018. Exam syllabus links is given below. Candidates must have qualified Civil Engineering B.E or B.Tech to apply online for this Sub Divisional Engineer Posts. Online application link will be active from 08-05-2018. Official website to apply online for this HPSC Sub Divisional Engineer Civil Jobs is www.hpsc.gov.in. Exam Syllabus link also available in this website only for this Haryana Agriculture Marketing Board recruitment of Sub Divisional Engineer Posts. HPSC Sub Divisional Engineer Civil recruitment vacancies, selection process, exam pattern and Syllabus and other details are given below. HPSC Sub Divisional Engineer Exam Date and Admit Card released dates will be updated soon. There are total 29 posts in this HPSC SDE Sub Divisional Engineer Civil Jobs recruitment 2018. Age limits are 17-42 years for this SDE Posts. For reserved candidates upper age limit is 47 years. Candidates who qualified Civil Engineering B.E/B.Tech with first division they are eligible for applying this HPSC SDE Exam 2018. Candidates selection will be beads on written exam and interview. Exam pattern and syllabus pdf details are given below. There will be only one paper comprising of 100 MCQ (Multi choice Questions), total marks 100 (one mark for each question) with total duration of two hours from the syllabus mentioned below. There will be only one paper consists of objective type or Multiple choice questions (MCQs) comprising of questions from the prescribed syllabus. Download HPSC SDE Civil Exam Syllabus in Pdf Format. Candidates who are qualified B.E or B.Tech civil engineering they are eligible to apply online for this HPSC SDE Civil jobs. Last date to apply online is 22-08-2018. HPSC SDE Exam date will be announced later. Exam Pattern and syllabus for HPSC SDE Vacancy is given above.